Do you now where the bees are? 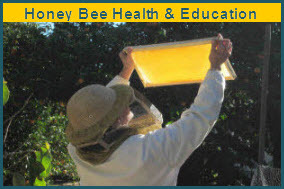 On Thursday, May 8 let's all step outside for three minutes and count the honey bees and other pollinators. It's all part of the "Day of Science and Service" sponsored by the University of California Agriculture and Natural Resources (UC ANR). If you're lucky, you'll find multiple pollinators sharing a single flower. 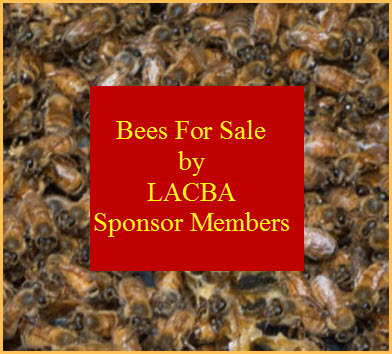 Maybe the foragers will all be honey bees, our prime pollinators! 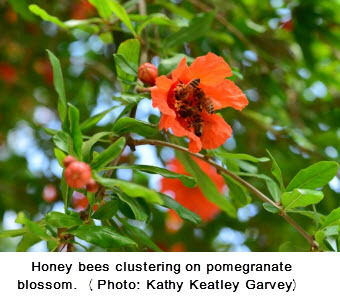 We took this photo of four honey bees vying for the same spot on a pomegranate blossom. A hot spot. It reminded us of humans fighting for a single parking space during the holiday season and then racing into a store and battling over a special gift (that will likely wind up at a garage sale in several months). In this case, the reward was nectar. Sweet nectar.